Beautiful You: Blogmas Day 24 | Christmas Eve OOTD! Blogmas Day 24 | Christmas Eve OOTD! I literally cannot believe that Christmas is tomorrow, I was talking to my mum at the weekend about how it literally feels like it was Christmas last year only yesterday and that this year has gone by way too quickly! 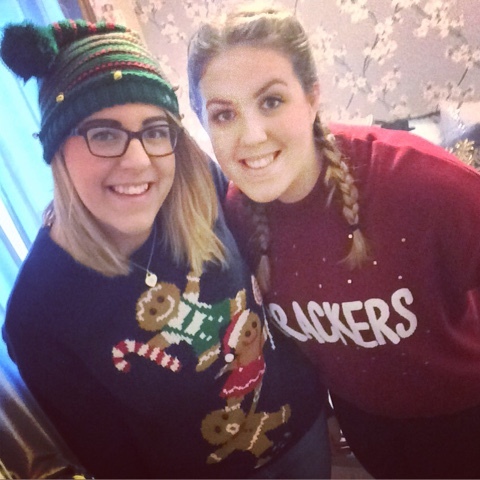 Anyway today we were travelling to my brothers house as that is where we will be spending Christmas this year and me and my sister both wore Christmas jumpers to travel in. Seen as I didn't really get up to anything else or know what else to write about today I thought I would share our outfits with you. I literally cannot wait for tomorrow, there should be a blog post going up just to say Merry Christmas and depending on how fast I can write about my presents I might share some of them with you. Never the less I will see you all tomorrow for the last day of Blogmas 2015! !